Back in February I styled The Mrs. Box shoot in Solvang along with some other lovely creatives. This was such a fun project as it allowed me to explore a different realm of floral styling. Who knew that styling flowers with tiny ring boxes could be so much fun? The urns, in particular, were fun for me as I tried to make them as 3D as I could on a flat surface, and I really treated them and placed the flowers as though I was creating a real life arrangement in water with lots of different textures and complementing hues. I had saved a number of potted poinsettia from the holidays, and they still looked really beautiful in February. Plus, I'm quite obsessed with their peachy colors, so I thought it would be perfect to incorporate them in one of my designs. They really look like watercolor. Jose told me this one looked like a painting! I would have to give most of the credit to those beautiful tulips and their incredible colors. It was super fun to make this very tiny bouquet (less than 2 inches all around). When I am choosing the florals for projects like these, I make sure to procure as many different flowers in different sizes, shades, and textures as possible...because to me, that is what makes these images so interesting. Of course, it goes without saying that Jose Villa's photography is impeccable! Images by @josevilla with @joelserrato, floral design by @tulipinadesign with co-styling by @maemae_co @greylikes and @kalebnormanjames featuring @shapirodiamonds rings. 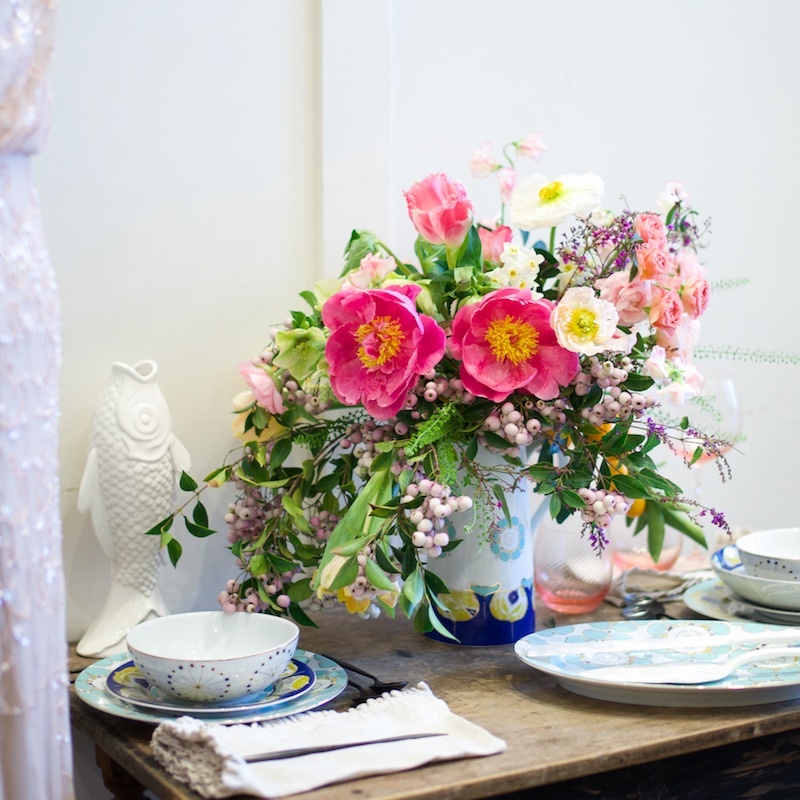 I recently did floral arrangements for BHLDN's bridal pop-up shop in San Francisco, and wanted to share some snaps that NRUPhoto took of the event. They wanted some soft hues, so I decided that one could almost never go wrong with blush and its variants. I know some of you are going to want to know what those pink bubble gum looking berries are!! They are berries that I foraged from a very awesome bush (the only one I've found) that I found in San Francisco and they are called Pernettya - I absolutely loved working with them!